Borussia Dortmund have now gone a club record 24 game sunbeaten at home in the Bundesliga. Dortmund and Gladbach build their fortress walls even higher, Mainz provide yet more entertainment and Niko Kovac finally learns to share the points. Here are all the vital statistics from Matchday 5. Find out if these stats gained you vital points in Official Fantasy Bundesliga! SV Werder Bremen's Robert Bauer scored the first own goal of the Bundesliga season. Eintracht Frankfurt’s Michael Hector scored with his first shot on goal in his Bundesliga career and teammate Alex Meier found the net with his only attempt at goal. Borussia Mönchengladbach have now won their last ten Bundesliga home games in a row. The last time the club enjoyed such a run was 20 years ago. Frankfurt had to settle for their first draw under coach Niko Kovac (seven wins, six draws to date). Games involving 1. FSV Mainz 05 have produced the most goals this season (23) with each match producing at least three. 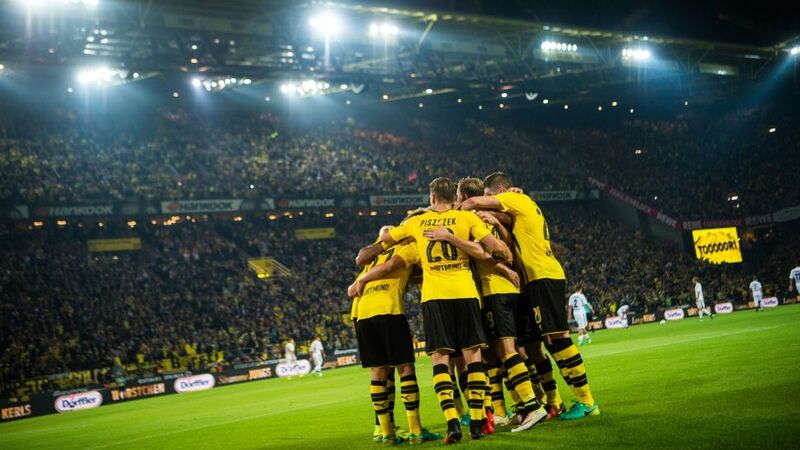 Borussia Dortmund have equalled a club record and are now unbeaten in their last 24 home games. The last time BVB went so long without suffering defeat at home came over 13 years ago under Matthias Sammer. FC Augsburg took the lead for the first time this season, scoring their earliest goal as well (47th minute). Joshua Kimmich has scored five goals in his last five appearances for Bayern and the German national side. The 21-year old had the most touches in Hamburg (101) and had the most shots on goal (five).